Following their report into Dental prices and the ensuing campaign Which magazine has done more research into availability of NHS dentistry. I feel it’s about time that everyone involved with NHS dentistry embraced (to use the buzzword) candour. A whole dose of honesty is needed all round, from government through the profession everyone must be able to agree what’s available (and what isn’t) and under what terms patients are being seen. It will take effort from the DoH – something that has been sadly lacking for the past 25 years and has only got worse since 2006 under the regime of the last CDO, Dr Cockcroft. We ask the Competition and Markets Authority to step in and ensure dentists comply with existing rules, as our new research reveals a third of dentists who say they’re accepting new patients actually don’t, and those that do have lengthy waits. Our undercover researchers called 500 dental surgeries advertising on the Government’s official website, NHS Choices, as accepting new NHS patients to see if they could book an appointment. We found the information on NHS Choices is often inaccurate as three in ten (31%) practices turned down our researchers because they didn’t have availability. Of those that did offer us an appointment, 29% couldn’t see us within two weeks, with one surgery saying we could book but we’d be facing a wait of eight to nine months. We also found practices making people jump through unnecessary hoops before booking an appointment, like visiting the surgery to fill out forms. Some were even asked to pay deposits, and in one case we were told this was non-refundable if we missed the appointment, but neither of these practices is permitted under Government legislation. Long waiting lists for new patients were also an issue, and we saw one practice that had a list 13 pages long and another that predicted a wait of two years. Some practices also suggested our researchers pay privately to see a dentist, despite our fieldworkers specifically asking for an NHS appointment. We repeated our research near the beginning of the new financial year to see if the information would improve when dentists got their new budgets, but we actually found an even worse picture. Nearly four in ten (37%) surgeries wouldn’t give us an NHS appointment and around a third (36%) couldn’t see us within a fortnight. This lack of clarity around availability for NHS appointments is part of a wider issue of poor information and communication in dentistry that Which? has exposed. Our ‘Clean Up Dental Costs’ campaign previously found evidence of dentists not being clear about the cost of treatment or what treatment patients are entitled to on the NHS, which could lead to people paying more than they need to. These are all issues which the Office of Fair Trading identified in its dentistry report in 2012, yet three years on the sector has failed to deliver on the recommendations made. We are calling on the Competition and Markets Authority to step in and ensure the dental sector complies with existing rules and improves the way treatment options, prices, and appointment availability are communicated to patients. “We found it’s frustratingly difficult to get an NHS appointment with a dentist as information about availability doesn’t reflect reality. This is a kick in the teeth for patients and yet more evidence of poor communication from the dental sector. In a separate survey of consumers, we found four in ten (39%) people would use NHS Choices to find a new dentist, highlighting how important it is that the website is kept up to date. It also revealed that 45% of patients who tried to book an appointment with a new NHS dentist in the last year found it difficult and one in five (19%) new patients went without dental treatment because they couldn’t find an NHS dentist. 1. There’s no need to register with a dentist as you would with a GP, as you’re not bound to a catchment area. Simply find a practice that’s convenient to you – whether near home or work. 2. Get recommendations from friends or family to help you choose a reputable surgery. 3. If you can’t find an NHS dentist, contact your local NHS England Area Team, which should be able to tell you about available dentists in your area. 4. Before you book an appointment, double-check whether you’re booking NHS or privately and how much the treatment will cost. 5. Be clear about NHS pricing before you see the dentist. Prices should be displayed in the surgery so ask if you don’t see them. – Half (51%) of people who visited a dentist in the last six months didn’t see a price list and one in five (22%) weren’t clear about costs ahead of treatment. – A third (31%) of people who pay for dental treatment say costs have put them off having treatment. – One in five (19%) NHS patients who pay said they paid more than once charge for one course of NHS treatment over the last two years, when they shouldn’t have. – In a separate mystery shopping investigation, half (12) of the 25 visits to a dentist were rated poor or very poor for explaining the difference between NHS and private options and eight poor or very poor for explaining prices. · all dentists make information on prices clearly available. · dentists explain treatment options, and make sure their patients know if their treatment is NHS. · patients get accurate information about NHS services in their area. 3. Over 19,000 people have supported our campaign since it launched in January. 4. The Office of Fair Trading carried out a market study in 2012, which recommended the General Dental Council and NHS England enforce the displaying of price lists and provision of treatment plans, with the Care Quality Commission inspecting compliance. The OFT also recommended that dentists be given the ability to update their information on NHS Choices, and suggested that NHS dentists who are unable to take on new NHS patients be required to refer patients to NHS Choices. Which? believes more needs to be done to ensure these rules are enforced. Part one – In March 2015, Which? fieldworkers contacted a representative sample of 500 dental surgeries across England. The dental practice provider profiles on NHS Choices were reviewed, and where they included a link to the practice’s own website these were reviewed too. In addition to checking the accuracy of information on NHS Choices, the fieldworkers also looked at this information on providers’ own websites to look for the availability of NHS appointments. All practices contacted were, at the time of calling, showing on the NHS Choices website that they were accepting new NHS patients. All practices were contacted by telephone during opening hours and fieldworkers asked the practices about availability of NHS appointments. 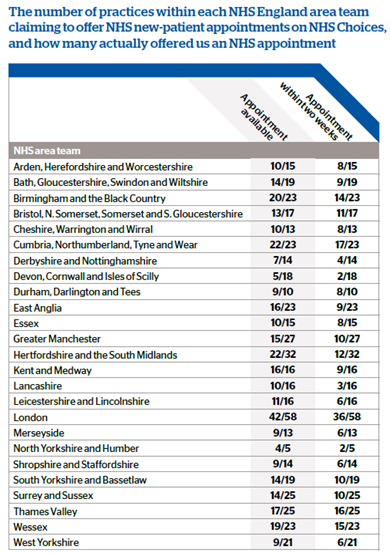 Data were weighted to be exactly representative of all NHS dentists in England by NHS Area Team. 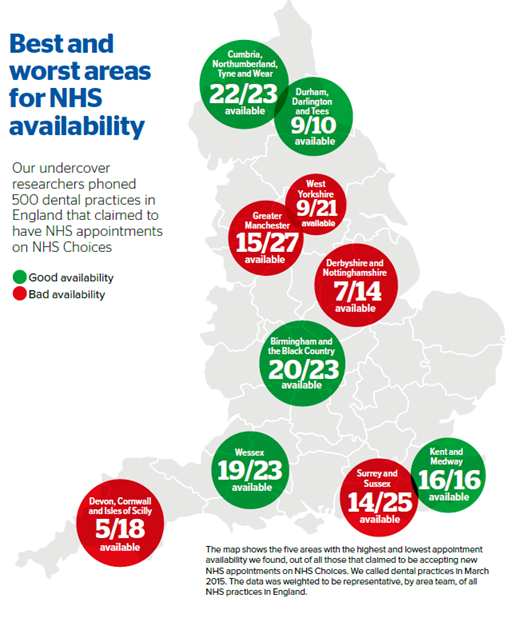 Part two – In May 2015, the fieldwork among 500 dentist surgeries in England was repeated. The sample included the same dentists from phase 1, unless they were no longer offering NHS availability on NHS Choices in which case a new dentist from the same NHS area team was used instead. Part two included some additional questions and data collection from part one. 6. Methodology for consumer survey: Populus, on behalf of Which?, interviewed a representative sample of 2063 UK adults online between 3rd and 4th June 2015. Data were weighted to be demographically representative of all UK adults.